The story-lines for Yasujiro Ozu's 1949 film Late Spring and 1962's An Autumn Afternoon (incidentally. his last work) read virtually identical - A dependent father realizes he must get his daughter married before she ages past eligibility and ends up an old maid. While contemporary woman's libbers may take umbrage, Ozu's films are a product of their time and social milieu, and the women in his films are strong in their own way. Anyhow, the similarity between these 2 films is not merely in the outline. Several sequences mirror each other to the extent that Autumn could be considered a remake of Spring. 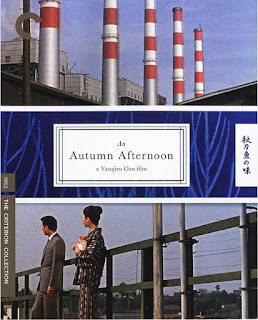 But that interchangeability is true for much of Ozu's output; his specialty is variations on the theme. The major difference between these particular films comes in the socio-political backdrop. Autumn plays out in post-WW2 Japan. Defeated and later occupied by American forces, traditional Japanese society is in the throes of change. It is never emphasized in the narrative, but we see the influence that Western culture is beginning to have. The pre-war generation still gathers in sake bars, talking about old times and arranging reunions (and making fun of their colleague who has taken a young wife about who wears the pants in the house). Their progeny represents a more consumer spirit, acquiring refrigerators and golf clubs. It is also less patriarchy bound, a wife can bully her husband (for his own good or otherwise) without social scorn. But in both periods, marriage and family remain an important institution, and the father must give up his selfish need to be looked after so that his daughter can have suitable companionship and start her own family. In Autumn, the tone with which this message is delivered is a bit bleaker, especially with the depiction of the father's old school teacher, whose lonely spinster daughter is unhappily chained to the care of her run-down depressed dad. Ozu's favorite actor Chishu Ryu once again plays the worried patriarch and does so with his characteristic subtlety. In place of his other favorite Setsuko Hara, the daughter is portrayed by Shima Iwashita, which is a good thing since a) Hara at this stage would have been a little too old for the eligible daughter part b) The daughter, while loyal to and worried for her father, is depicted as being more assertive about herself than in Ozu's previous work, another sign of the times. I don't recall if this was the case with the other Ozu films I've seen, but one thing that struck me during the viewing of Autumn was how every scene begins with a couple of frames of the location or set where the scene takes place: the patriarch's house, his office, the bar he frequents, the house of his married son, the street where his school teacher lives. Never does a scene in a different location begin without first establishing the place. As expected with Ozu, the visuals are entirely a function of the framing, with no camera movements at all.